Although Ben Franklin’s kite experiment resulted in the invention of the lightning rod which helps keep lighting from destroying our homes, that is not an experiment we want our children to try because it can be fatal. But the notion that there are negative and positive forces all around us can tell our students to be aware that we have the power to attract positive thoughts and actions and to reject negative thoughts, actions and people who would lead us to negative actions. This is a God given power which our students should remember and be grateful to Him for all His blessings. Today we will do an experiment to demonstrate static electricity. Benjamin Franklin’s experiment with electricity proposed that electrical fluid (as electricity was called then) had positive and negative properties, and was the first to discover the principle of conservation of charges. Franklin was not only a scientist, author, publisher and inventor, he was a man who was pulled out of school at an early age to help support his family, but through self-education became a man who influenced the set of principles on which our country was founded. Honoring Benjamin Franklin is a reminder that through God, all things are possible. 1. Mix the salt and pepper on a paper plate. 2. Rub the plastic spoon vigorously against the wool sock (or your hair). 3. Hold the spoon about an inch above the pile of salt and pepper. 4. Both salt and pepper will be attracted to the spoon, but pepper is lighter, so if the spoon is in the right place, the pepper should jump up and cling to the spoon. 5. Rub the spoon against the sock or hair again and repeat until all the pepper has “jumped” to the spoon and only salt remains. When spoon is rubbed against the wool sock or hair, it becomes negatively charged. 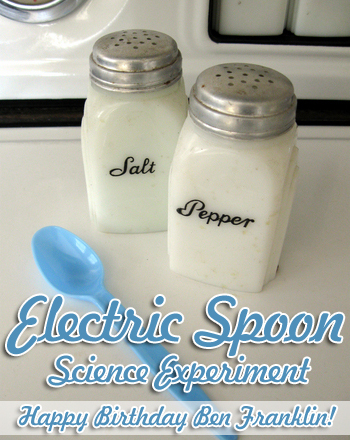 The salt and pepper are both positively charged, which means they will form a natural attraction to the static from the spoon. When the spoon is slowly placed above the mixture, the pepper particles fly up and cling to the spoon. Pepper particles are much lighter than salt, so they are quicker to attract to the spoon. But if you were to bring the spoon closer to the mixture, the heavier salt would eventually cling to it as well. To prove this, try the same experiment using only salt. The author of Proverbs 23:7 got it right when he wrote… “As a man thinketh in his heart, so is he”. It’s the old Law of Attraction. The way we think draws either positive or negative energies to us and those around us. We may not always realize it, but we have the power to draw people who follow the path Christ has set before us or people who can lead us to evil. Thank God every day for the wisdom to make positive choices. I love experiments that relate to electricity. They spark kids to learn more about it and can lead to great career paths. I say the more the better. Keep them coming!